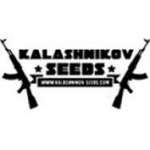 Kalashnikov Seeds - Black Babushka Auto. Free US delivery. Black Babushka Auto is the world's very first cross of a Crimean Ruderalis plant with an indica from Pakistan. It displays dark violet colours and becomes absolutely covered in resin making it a great selection with which to produce a range of cannabis concentrates and extracts. This plant is 80% indica with 10% each of ruderalis and sativa genes. During growth it remains a short plant that will reach 50 - 80 cm. in height. It takes a mere 55 - 60 days from the seedling stage to be ready for harvest and does equally well indoors as outdoors. In warmer regions it will be possible to cultivate more than one crop per season when growing outdoors. Indoor-grown plants will yield between 300 - 450 gr/m2 while outdoors each of these autoflowers should produce anywhere between 35 - 110 gr. of resious buds. Black Babushka Auto exudes a scent that is reminiscent of earthy hashish to sweet berries. On the palate one notices black tea and cherry jam. THC production is good at 19% and the effect is comforting, relaxing and will ultimately ensure a good night's sleep.